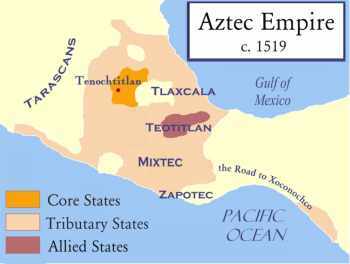 Most people today are somewhat familiar with the Aztec empire. But it may surprise you to know that there is a great deal of disagreement over what kind of an "empire" it really was. This Aztec empire history may surprise you. Of course, even the term Aztec is a bit misleading. It's a name that is used for a group of peoples in Central Mexico, but really there wasn't any one people group that was "Aztec". The Mexica people were at the heart of the empire, but there were many other cultures that formed the civilization that the Spanish were to discover. 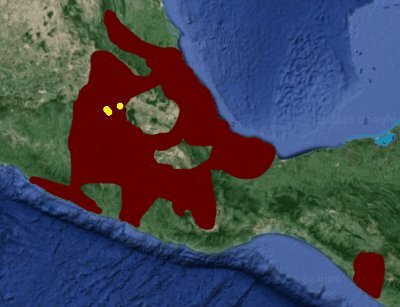 Many years after the Mexica people first built their proud city, Tenochtitlan (later to become Mexico City), they formed an alliance with two other cities - Texcoco (Tetzcoco) and Tlacopan (these three cities are shown as yellow dots in the map above). This Triple Alliance was to rule the Valley of Mexico until the Spanish arrived. However, over time one city become the most powerful - Tenochtitlan. It would become the heart of the Aztec civilization. The city of Tenochtitlan was the military power, which spearheaded the conquest of new territory. But the Aztec emperor didn't rule every city state directly. Local governments would remain in place, but would be forced to pay varying amounts of tribute to the Triple Alliance (with most of the tribute going to Tenochtitlan). You also need to remember that the Aztecs didn't necessarily rule connected territories. Because they were conquering cities, they sometimes had power in "pockets" over an area. But don't think that this was a weak empire. Ruling through a local government ensured that the locals would keep the people happy, and that there would be stability and continuity. This system worked very well for the peoples of the empire. More about the Aztec civilization here.